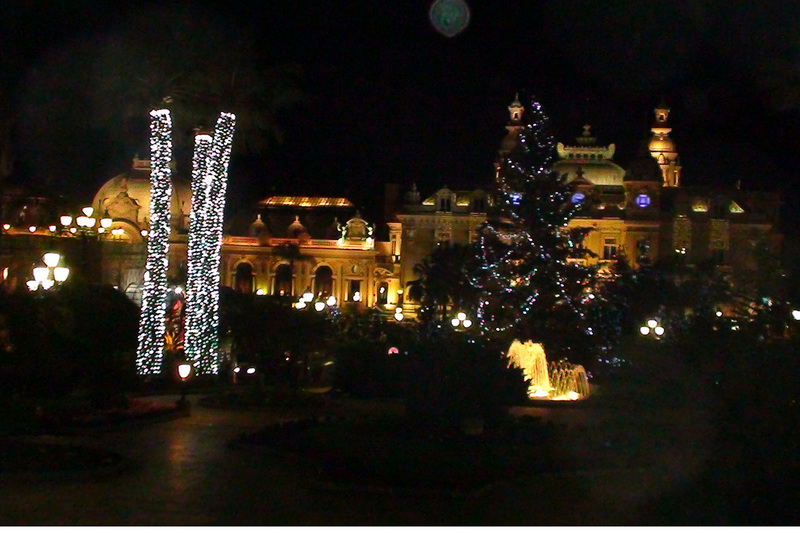 Casino Square, Monte Carlo on New Year’s Eve. There’s something about New Year’s Eve. It doesn’t seem to matter how often you say that a quiet evening at home with a good bottle of champagne is the ideal way to ring in a new year, given the opportunity to do something truly memorable, most of us would jump at the chance. The question is: precisely what constitutes a memorable New Year’s Eve? As these discerning travelers contemplate a quiet New Year’s Eve at home for the first time in four or five years, we’re transported to three years ago when we spent the first of a couple of first nights in what is arguably the land of the most conspicuous consumption on the planet: Monte Carlo. The day begins with a visit to the local Carrefour. A gigantic grocery store that rivals Wal-Mart for its variety and Whole Foods for its quality, the place is a zoo at the best of times, but New Year’s Eve is special. We begin (and it has to be said, also end) at the extensive wine section. The sheer array of French wines that begin at about 3 euros a bottle (we kid you not), and go upward from there is dizzying. And the problem is that we have rarely had a bottle from Carrefour that we didn’t like. So how to choose from among all of these unknown bottles? Our usual tactic involves stealth observation. Watching the men and women going up and down the aisle filling their baskets and carts to the brim with bottle after bottle is the best place to begin. Then we get a bit more discerning (!). We look at how many bottles of each kind of bubbly make their way into how many baskets. Then we watch the individual purchasers. Are they old enough to have experienced a bottle or two? Is the arrangement of their scarves just stylish enough to imply a bit of je ne sais quoi? Are they secure enough in their choice that there is no waffling? When all systems are go, we swoop in and choose the right bottle of champagne – and make no mistake, it is always right. But then where to drink it? We’re getting to that. 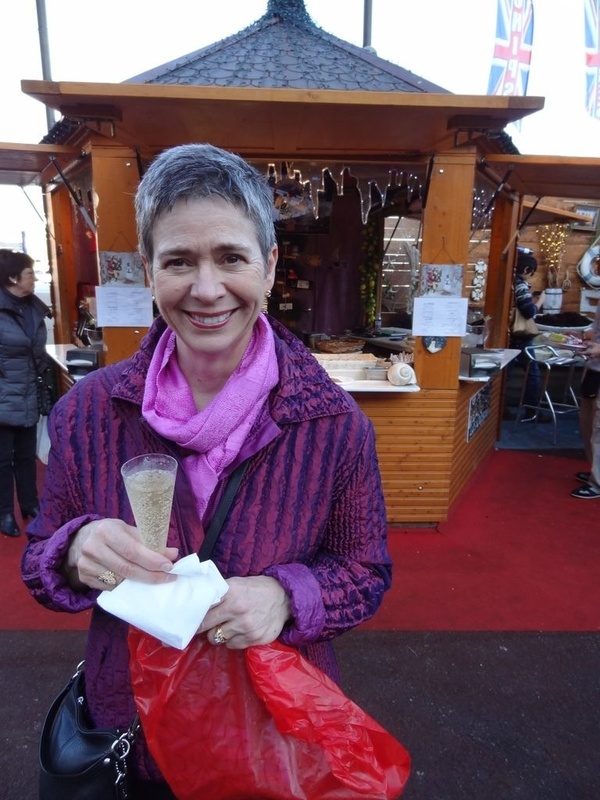 Grabbing a glass of bubbly at the Monte Carlo Christmas market. 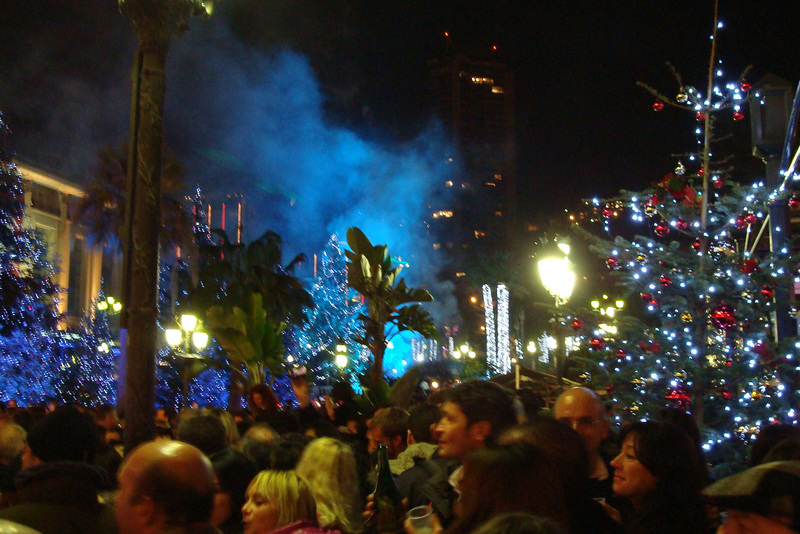 The day is young so we’re inclined to wander a bit through the Monte Carlo Christmas market where we indulge in the decadence of a glass of quality champagne outdoors from a plastic flute. We watch the skaters take a turn around the temporary rink on the MC waterfront, as ludicrous as that seems. Then we head back to the hotel to get dressed. We’re going to the ballet this evening. We don our finery and make our way to the Grimaldi Forum with what appears to be the majority of the Monagasques themselves. Situated on the shore of the Mediterranean, the building is actually built right into the Med with the main performance space where we’ll see Les Ballets de Monte Carlo dazzle their home crowd below sea level. Down, down, down, three very long escalators to reach the entrance to the orchestra seating. We sip more champagne while we people watch — can there be a more decadent place to people watch than MC? We spot Louis Vuitton, Gucci, Chanel, D & G, Hermes, all milling around the bar. Then the bell chimes three times — time for the curtain. We take our seats and Patty puts her handbag on the hook on the back of the seat in front of her. Such a thoughtful touch – the designers must have thought of all those expensive handbags that would grace their auditorium through the years. We then glance surreptitiously toward the royal box to see if Princess Caroline might be gracing New Year’s Eve with her presence – or perhaps Prince Albert (that was before he married Charlene). Then the curtain rises, the orchestra begins, and we’re transported into the rarefied world of the ballet, thanks to our son the dancer who is sharing the stage with his colleagues. The ballet is over at 11:30, and all of us spill out into the Mediterranean night that is lit with hundreds of thousands of twinkling lights. We make our way up the hill to the casino square where side by side with the palm trees lit for the season are 50-foot high fir trees brought in and decorated so that the lights change colors. We are transported along with the crowd. Once in the square which is already shoulder-to-shoulder full of well-dressed revelers, we get into the spirit of the night. The countdown begins. “Dix-neuf-huit-sept…deux-un! Bonne année!” And the corks begin flying! Pop! Pop! Pop! Then splash! As the champagne is poured from bottle to plastic flutes as everyone wishes anyone around a happy new year. Coming as we do from North America, the very fact that it is perfectly acceptable for this crowd to pop their champagne corks in this very public place and enjoy a sip of New Year’s bubbly makes the experience all that more decadent (there’s that word again!). We are delighted and know that it will be a good year, indeed.